Well, that’s it: it’s done, i can do no more. Literally, as if i were to climb any of the outstanding lines, they wouldn’t count. The Indy Winter Aggregate has finished. So, despite the nicest weather we’ve had in North Wales this year on Wednesday, my evening was spent back at the Indy scrabbling for just one more point. After all, with scores tight at the top, it might make the crucial difference. As far as i was aware, there were only three outstanding lines left to try. Irritatingly, despite only three graded 7a or harder, they were nearly all quite tough! Normally 6s fall very quickly for me, normally on the first effort, but every one, save the occasional 3 or 4, made me put some effort in and got me thinking. I think there were at least six climbs that didn’t get flashed. Still, they all got done – including the 7b+ black route that captured most of my attention for the session – and thus concluded another fantastic winter climbing aggregate. A couple of years ago, i posted a big thank you for the end of the aggregate and it’s been interesting to find it and read it again. The same is as true now as it was then; the only difference that perhaps i’ve started to take it for granted a little more. Every year there are ups and downs with the aggregate and this year has been no exception. That said, the ups have far outweighed the downs: faces have mostly been stripped and set as a whole, eliminating a route being taken down prematurely or getting in the way of the new set, the weekly setting has returned and the grade range has been excellent as always. Most importantly of all, the routes have been 98% awesome. It is tough to set good lines, especially consistently week after week, but the Indy do this very well indeed. Other walls – the Boardroom, so i hear – do a big reset of the whole wall but the graduated approach always gives you something fresh to tick off and something hard to project. This year, they nailed it. The downs have mainly been to do with grading, where it has been a bit erratic this season. While it’s not the end of the world, it can get a little frustrating to sail up a 7b within a couple of attempts and then fail abjectly on a 7a+. Nevertheless, they are one of the few remaining walls that grade their climbs with actual outdoor grades, not colour grade boundaries and if the price to pay for that is some iffy numbers occasionally, i’ll take that every time. My only other complaint would be the regularity with which the scores have been updated but again, it’s not a serious problem and considering i sat in top spot for five months as a consequence, it kinda worked out in my favour! Yes, this is normally a monthly update and it would be nice but knowing the lads as i do and knowing how this season has gone for them, it is understandable, in exactly the same way as routes not being immediately numbered all the time. Given the circumstances and what they’re actually trying to achieve, they’ve yet again done a stonking job. One thing that hasn’t changed is the atmosphere, vibe of the place; yet again, it’s a real local hub. Part of the reason for my pseudo-supremacy is the lack of regulars out playing this year but there is new blood – there to make me feel old – coming in all the time and really grasping the ethos of the wall. No elitism, no snobbery, just climbers, there to climb and socialise and happy to help each other out. All in all, win lose or draw, it’s been another great series. The Massive Monday Series has added an extra element of competition and was another storming success and from a personal perspective, it’s done for me exactly what i needed it to: it’s got me strong again. Not back to the levels of this time last year, ticking off the hardest lines of my life but back to some sort of form; something i can now go and build on. And that is exactly what i wanted. With outdoor sessions now firmly on my mind, I did manage to make the most of the good weather during the day – nipping out into the forest to snag two more first ascents in Bryn Engan. Life is Rosie 6a and Slabadabadoo 6c won’t be turning any heads any time soon but are worthwhile lines to add to a growing circuit. And besides, i’ve now got a climb named after my daughter, which makes it all okay. The days are getting noticably longer and the weather beginning to show signs of turning. The end of the month brings with it the changing of the clocks and the turning of the Climbing Year. What happens now remains to be seen but at least i feel primed to give it my best shot. With my new family for company this year. We finished the last post about to depart on a week long trip to Scotland, although the circumstances before departure were less than pleasant. The week before we left, on the Tuesday, i came to work expecting my colleague to already be in waiting for me. He wasn’t there, hadn’t come in by 9am and as time ticked on, stories began to appear in my head as to what had happened. I jokingly said that maybe he was dead, only to find out early in the afternoon that, very sadly, he had actually passed away that very morning. It was very sad indeed, being a tragic accident where he had fallen down the stairs and succumbed to his injuries three days later. I’m not going to go into a large obituary or eulogy but he does deserve a mention. He wasn’t everyone’s cup of tea, and had a tendency to be a little curt and rude with people but he was my friend, a good, honest and true man who you know would be there for you if you needed him. Life here hasn’t been the same since and he will be missed. Rest in peace, Pete Wright. The following Saturday morning, on Em’s birthday no less, we set off from home bound for Edinburgh. Adopting my tradition of getting away for your birthday, we’d both long since wanted to visit this fantastic city and, after a mildly long drive (it’s not Stockholm, after all…) we had a great couple of nights in the Scottish capital, finding two fantastic eateries and enjoying wandering the historic city. It was definitely nice to do something a little different to our usual wilderness excursions. The next leg took us much further north, up to Torridon, where i had heard the bouldering was some of the best in Britain. Not wanting to pass that up lightly, the opportunity to have a blast on the blocs there whetted the appetite nicely. Whatever the bouldering was going to be like, it was impossible to argue with the scenery! Huge mountains surrounded us on all sides with the nearby Loch leading out to sea not far from our free campsite. It definitely helped that we were blessed with some stunning weather to boot. Sadly, though, the weather is never a sure thing in Scotland and we only managed a mere single day on the boulders. The fact we split it into two sessions did mean we made the most of it, though a second day (as had been planned) would’ve been much better, had we not been driven from the campsite, let alone the crag, by more midge than I ever could’ve anticipated. A full report on the bouldering in Torridon can be read here. With the wet weather slowly on it’s way, we opted to move on and it turned out to be a good decision. The rain began the night we left, meaning we were forced to pack up a wet tent and spent a reasonable amount of effort trying to find some solid lodgings for the Thursday night, further south near Glen Coe. Friday came and the weather was not only refusing to relent, it was worsening. Further south we ventured, in search of respite and with the target being the southern munro, Ben Lomond. As we drove along the shoreline of this famous lake, i pulled out the laptop and played Benny Goodman’s 1938 version of Loch Lomond. It may sound silly but as the weather once again turned dour, anything to keep up spirits was welcome! By the time we set off from the car, the drizzle was setting in, and it wasn’t long before we were engulfed in cloud, slowly getting wetter and wetter. We must have made it about half way before a wet crotch made me lose the will to continue and to my relief, i wasn’t alone. Dripping wet, we turned around and headed back down. Back at the car, it got worse, with many other bedraggled walkers coming past and finding Tess very amusing as she jumped to try and catch the deluge falling from the drain. The forecast wasn’t looking to improve much and so, reluctantly, we opted to sack off the ominous task of finding somewhere to stay and pitch a wet tent and instead, packed and headed home. Since then it’s been business as usual: talk about baby things, try desperately to stay on top of the mess at home, think about trying to get out and climb again and lose the summer podge that seems to have developed around my midriff. To date, the only excursion of any note is some work on an old cleaned boulder just by work: the Bryn Engan boulder. It’s an old one, climbed many moons ago and thus almost certainly not first ascents. However, i’m claiming them as First Recorded Ascents. Either which way, with nothing properly established there, i’m naming and grading them. It took a solitary session to get the first few lines (the straight ups) on the Saturday that Pete actually took his fateful fall. This was on the way to the CA leaving party, meaning two of the lines are now Fond Farewell 5 and The Wright Stuff 6c, with the two aretes being Right and Left Arete at 3 and 6a respectively; the quality of them not really warranting any real thought on suitable names, despite my naming practices to date. This left the last link up line. This one took a good three sessions in total. First was there with new CA, Jack. In truth, the conditions really weren’t ideal with the unusual mix of midge and drizzle, with the temperature quite warm. Nevertheless, the face is slightly overhanging so climbing remained possible and we persevered, anxiously trying the moves and fathoming the sequence. Heels and toes were heartily employed but to little avail as we both ended up stuck, horizontally across the face. Nevertheless i topped out and immediately phoned Jack at work to share the new sequence and success. With the imminent(ish) arrival of what we reckon is my son, the hardest line and best on the boulder is now Awaiting Arthur’s Arrival 7a+. The prospect of increasing my top-ten yearly average for 2016 from it’s current level of 7b+ is rapidly dwindling. While Awaiting Arthur’s Arrival was a real coup, it was by no means a tough test and is not a sign of improvement per ce. However, the good old Indy Aggregate starts again in the next few weeks and while my final position last year of 4th was far more likely to be a little bit like Leicester winning the Premier League, i am determined to get back in there and start training again. Meanwhile, there remains my membership at the Mill that has largely gone unused and of course my ability to set new problems in the climbing wall at work. Meanwhile, the North Wales Bouldering Guide is nearing completion and should, in theory, be ready for the start of my new year. I’ve seen a handful of sections now and am thrilled that my little name appears in there! Prowess among most of my other lines, made it in! Result! Of course, as soon as the new guide arrives, it will offer a host of new problems and a world of new psyche. My main hope now is that i’m fit and strong enough to make the most of it. There’s still a month left before my mid-season solstice (when the clocks go back) and then it’s training time. The lantern is out and ready to be charged up – i need to find the charger first though – and then it’ll be time to do a bit of a review. Given the way the year has gone, it should be pretty positive! Perhaps not quite as drastic as that, as my Instagram profile will attest but even so, considering my online silence of late, there’s certainly been much more going on than meets the eye. It’s always best to start where you last left off, ignoring the recent journalistic post on climbing becoming an Olympic sport, and that takes us all the way back to early July, with Tess still enjoying the France’s Northern coastline. Needless to say, she got back fine and all quickly things returned back to normal. Well, not really. We hadn’t been back very long before Em decided to try and find out what had been causing the lethargy and illness she’d been suffering with recently. And so it came to pass that i came home from work one day and was told, “I’m pregnant”. From there it’s been a period of adjustment, excitement, secrecy and announcement. The initial overwhelming nature of such news has worn off and we are both very excited about what now lies in wait for us come February and beyond. From my (slightly selfish) point of view, things look very good indeed: Em has assured me that this won’t stop me from climbing and i’ve gone from trawling the internet for the best bouldering spots in Europe to best ways to go bouldering with a baby and it’s things like this that show me i’ve found someone truly wonderful. It’s going to be a huge change to both our lives and one we can’t wait to start with. Maybe it was the huge news or perhaps some seasonal heat sapping out the psyche but since then, i’ve not really been able to get going again. My grade has dropped from working and ticking 7c+ back in March to the mid- or even low-sevens now and this has had knock on effects. I’m not on form so struggling to find psyche, which pushes down the grade. This means that most of the list is currently infeasible; something which is in itself demoralising. This drops the psyche still further and means even less of the list is attainable and so the spiral continues. It’s a bit of a catch-22: i’m lacking psyche to get on projects and lacking attainable projects to build psyche. There have been a few isolated days over the summer and a recent week away but never enough to build the momentum needed to come back to full strength. That’s not to say they haven’t been worthwhile though! First Welsh session since our return was one i’d actually forgotten about with Alex Battery from work – a man i’d long since said about climbing with but until now actually hadn’t. The venue: Rhiw Goch for an optimistic punt on Nazgul’s Traverse 7c. In truth, it went much better than i’d expected and i began to put some much needed thought back into my climbing. Nevertheless, it wasn’t really followed up with anything until a couple of days in mid-August. Every year, Plas y Brenin is blessed (maybe an overstatement…) with a new intake of eight Centre Assistants and it’s only a matter of time normally before i drag some of them out for a bit of a boulder. In this case, it was them dragging me out, with Jack, Isaac and Alex offering me an evening at my old favourite, Caseg Fraith. It was a decent session, much better for the lads than for me as i failed to repeat Boneyard V8 and thought much better than trying to even look at the outstanding project line there – an ambitious 8a. Still, again, always good to climb with new people! And it was the day after as well. I’d been keen to spend some more time with Em’s family; not least her brother, James so when he got in touch to go for a boulder, it seemed ideal. Not wanting to plump for the obvious, i mistakenly neglected a trip to Sheep Pen to take us instead to Elephantitus cave. In hindsight, with James never actually having been to Sheep Pen, and the distinct lack of problems to go at, it was possibly poor judgement and one that led to neither of us tasting any success. Nevertheless, James did remarkably well and will almost certainly tick it next time. And so, other than a brief time killing session on a boulder in Bryn Engan one evening after work, takes us right up to last week’s trip to Scotland. I’d been meaning on writing a moaning piece; a wingeing, complaining feel-sorry-for-me diatribe on roasting heat, failing standards and an inability to do what i wanted. Then i finished work on Tuesday night and left for home. Not thirty seconds out of the drive, i took in the view – one i see daily but rarely stop to appreciate. I saw the green of the grass, the still water of the lake, the crags on the hill above me, even the rust on the barbed wire of the fence that often fails to pen the sheep successfully and thought next week, this will be Sweden. Then just as suddenly, and? What’s wrong with this? Now Thursday, and i’m a bit lost as to what to write about! I can’t deny that my standards have dropped significantly recently – not three months ago, i ticked my first V10 and now struggle on 7b+ – and, with climbing being my underlying reason for being, have been a little down of late. The problem with all your eggs in one basket is when that basket gets a whole, you’ve lost all your eggs. Part of the issue is evidently in my head. I’m lacking psyche and commitment; something i alluded to in my last post. This hasn’t changed since then, although i am now a lot more aware of it. And while i’m not normally one for blaming conditions for poor performance, it has been so ludicrously hot lately that even sitting around at work means bathing in clothes soaked with your own sweat! When even walking in to the crag is a feat of human endeavour, it’s not really a surprise i’m not climbing at my peak lately! This has also led to a drop in strength and if i’m honest, the idea of mid-summer training in the wall is almost soul destroying. I don’t remember the last time it rained, i should be outside! Making the most of it! Which then leads to feelings of guilt. And this has led me on to a mild epiphany. Truth be told, i took a few weeks off climbing. At first, this was due to a weird niggle in my right arm but then developed into not particularly wanting to go out! And do you know what? The world didn’t end, i didn’t spontaneously combust, nothing happened! In fact, i just found myself enjoying being alive in weather that wasn’t soaking me from above on a daily basis. I spent more time with Emily, just living (and moving her into the house, progressively) and walking the dog, teaching her to swim. I’ve detached myself so much from climbing these past few weeks, i voluntarily gave up a spare evening alone to faff around the house and take Tess down to the lagoons for some swimming. And it felt great! Not that i’ve stopped entirely, with two notable sessions. An old friend, Glyn, got in touch to see if i was keen for a blast on Corridors of Power 7c+/8a. With it now being on the list, i thought i’d give it a blast, scout it out, see what it’s like. It was also nice to support a friend on a project. It went well, although i’m still not strong or confident. Maybe that’s the key for now – find out the beta on climbs while i’m struggling? Or perhaps sticking to focusing on a few is a better idea? Not sure. I do know we had a great evening before being chased away by midge – another issue with summer bouldering in North Wales. The other excellent session was with Emily. We’d talked about doing more with ourselves and it occurred that a prolonged dry spell like this opens up the mountain crag, Cwm Dyli. It’s not so much the rock that needs to dry out, it’s the approach and as we romped across the hillside, I reveled in the fact the ground was bone dry. I didn’t actually get much done, and nothing new – the intended V8 being a lot harder to fathom than i’d expected. Far more importantly though was the success Em enjoyed! She flashed her first V1 with relative ease, after some demo and beta from me and then, just as importantly, tried something harder and experimented with different positions and grips. What’s crucial is after failing, she got back up and tried it again. If you asked her, Emily would say she’s not much of a climber but she does get out there and try things, and is willing to give it a blast every now and again. We’ve only climbed a couple of times together a couple of times but i have been taken by how technically good she is – honestly. I’ve seen much more dedicated climbers struggle to grasp concepts she just does naturally. On our little session, I was very impressed and proud of her and thrilled she’s coming out and joining me at the crag. Even more importantly, she wants to join in and that makes all the difference. Most importantly of all, i’ve learned over the last few weeks that when the weather is nice, it’s good to be alive. It doesn’t matter that i’m not climbing hard things, it’s just pleasant being here. This is why we live here after all! So that when the weather is nice like this, we’re already here. Going back to our opening sentence, why would you want to be anywhere else? Not that any of this recent zest for life in North Wales has quelled any of my longstanding wanderlust. My ferry is now booked for Monday morning, 00:50 and from there the adventure begins. It’s a tale of foreign friends and familiar faces, of miles of driving and bouldering all over Southern Sweden. I’m past the point of nervousness now and am itching to get going. Granted, i have a long and lonesome first stage – driving to Kobnhavn alone to meet Simon – but from there, i shouldn’t be alone much. There’s a host of venues i’m hoping to hit, for at least a day or two: Kjugekull, Vastervik, Gavle, Stockholm, Hono, it’s gonna be a proper little road trip! But with standards being what they are, and my annual goal of a foreign 7c being done and dusted, i’m going to put a cap on projects for this one at 7b+ to try and stop me wasting time on things i’m unlikely to succeed on. If i can get a brace of 7b, it’ll push my annual average up as it is, and a few 7b+ will push that still further. After a couple of posts from friends, i may have talked down the week ever so slightly. So, in the interests of optimism, here is the same review but with an upbeat approach. Every word of both posts is completely true. Every other year, i get the honour and privilege of travelling to Scandinavia, to explore more of what i believe is one of the greatest areas of the world. I’d love it to be more (i’ve even considered moving there a few times) but it’s a biannual visit because in the opposing years, my good Swedish friend, Fredrik comes to visit. After a hiatus last year for his wedding (marrying another good friend, Karin at a ceremony i was honoured to attend and even gave a speech) last week was once again Fredrik’s turn. With Tobias making his maiden voyage to these shores, i was keen to offer some hearty local dishes and throughout the week, i think i succeeded quite well: pan haggerty, more bangers and mash than we could finish, bacon butties with brown sauce, fish and chips, shepherd’s pie, it was a hedonistic and gluttonous feast from day one. And day one proper was quickly upon is. A relaxed start (with Welsh Rarebit) meant we had time to ease into the day, and the easy decision to start up at Sheep Pen. Fredrik had missed this North Walean Wonder last time round and with Tobias climbing around the 6c sort of area, it was a good choice. I was vindicated in my decision pretty quickly: The Pinch 7a+ went quickly while my back was turned, i got a new highpoint on the tough first move of Jerry’s Problem 7c+ and Tobias sent his very first 6c+ in Toe Dragon. Traditions being the theme of the week, this ascent prompted another that my compadres had been doing for some years: a new top grade warrants a bottle of champagne. We even got a quick visit from Emily – a welcome surprise. The weather had sat on the cusp of good and bad all week, raining overnight but stopping late morning, allowing us to go in search of dry rock in the mountains every day. Friday was just such a day and the strong wind was enough to counteract the overcast skies. With projects from two years ago in mind, we made the trudge up the hillside above Ynys Etws towards the Wavelength circuit. It was another day of ticks, although mostly for Fredrik this time as he quickly flew up Utopia Left Hand 6c before a quick look at Love Pie 7c after my tick on Monday and then up the hillside to exorcise the demons surrounding King of Drunks 7a and the tricky Groove 6b that he had left previously. Windswept and windburned, we returned home, with three days of trudging the hills and crushing problems taking it’s toll. Not to be discouraged, we checked the forecast and Saturday looked good: sunshine, not a hint of rain but a steady breeze. 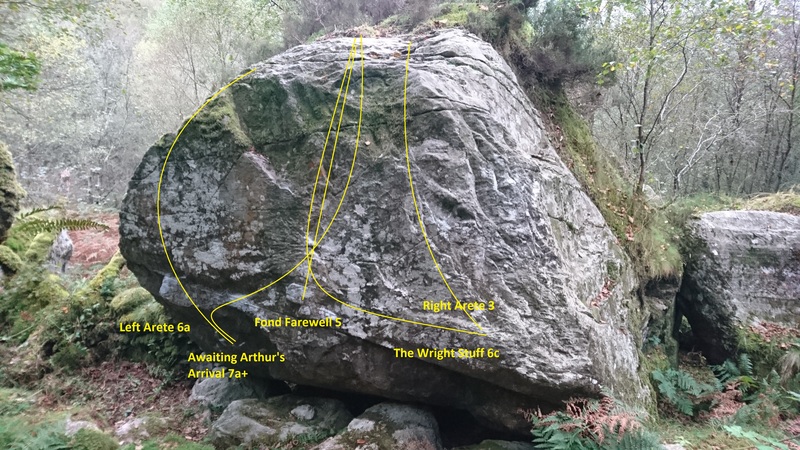 The plan: the so-far unvisited crag of Crafnant. While it was a way away, it would catch the breeze and would offer the chance for more V-points than we could possibly achieve. Sadly the risk didn’t pay off, with the skies as grey as Sean Connery’s hair and the air as still as fruit juice without bubbles. Even moving around proved trecherous but not to be discouraged, we made an early decision and went back to the Cromlech boulders for a headtorch session. It went well, with Tobias getting another V5 (a dyno Loose Canon) as well as a handful of various other bits before Fredrik’s valiant effort on Bus Stop 7b+ and my own efforts on Diesel Power 8a and Jerry’s Roof 7c, despite tendon problems in my left hand. With their flight not until 6pm, the last day was up to the lads to decide and i was pretty chuffed when they decided to go and try and repeat some of my own problems around Bryn Engan. With conditions lacking, we brushed with vigour to try and get the holds just dry enough and while Prowess proper didn’t go, the 6b+ stand start was a consolation and Fredrik got to try enough to admit he liked the moves – a win in my eyes. Tobias meanwhile was feeling the effects of a heavy week and had called it a day – a good sign that his time hadn’t been wasted. That being said, as we called time on the week and wandered around Betws before the drive to Manchester, i realised that even though things hadn’t quite gone as well as they could, it was always nice to see my friend again, and a pleasure to meet his brother. Granted the conditions hadn’t come close to the fantastic days i’d somehow managed to find over the summer; we had got out every day, getting good, worthwhile ticks in the process. Even if that wasn’t the case either, social time in good time is never wasted and now i can look forward to my next Scandinavian trip next summer to the island of Aland.